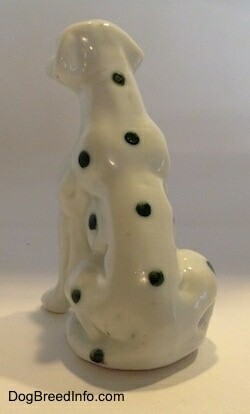 This is a retired giant vintage West Germany Dalmatian dog by Goebel. 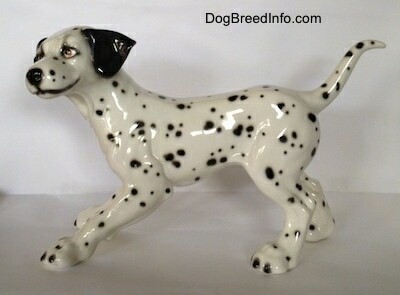 This is a very large figurine standing 9 1/2 inches from the ground to the top of the head, 15 inches long from the tip of the ear to the tip of the tail and 6 inches wide across the front from paw to paw. On the bottom is the trademark 6 (TMK-6) Goebel logo stamped in blue of the name Goebel and W. Germany below it. This dates the figurine, which is borderline statue size, between 1979 and 1990. Engraved in the bottom is the number 30021-38. 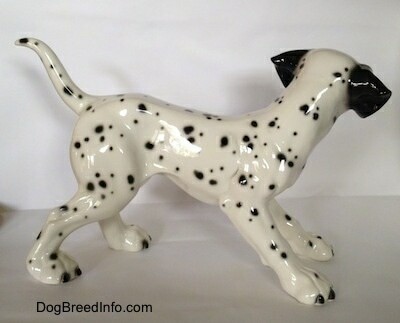 This is a very spunky looking dog which captures the true character of the Dalmatian breed. It is in mint condition. 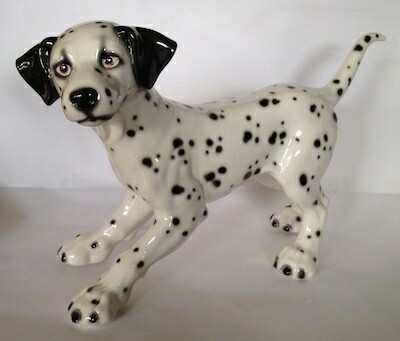 Retired giant vintage West Germany Dalmatian dog by Goebel—image showing the Goebel trademark 6 (TMK-6) logo stamped in blue of the name Goebel with W. Germany below it. 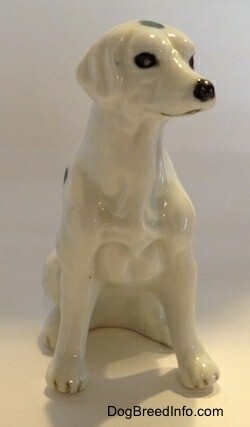 This dates the figurine between 1979 and 1990. You can also see the engraved numbers 30021-38. 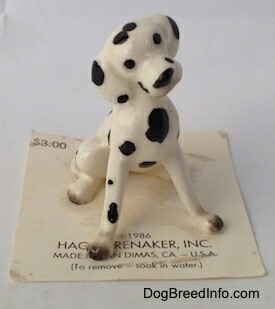 Pictured are some of the miniature Hagen-Renaker Dalmatian dogs. These hand-painted figurines were all first put on the HR line in 1959 and retired in 1986 and were later all re-issued to the line. They were all made in the USA. The pup on the far left is an older dog from the 1960s. It is item number 455. 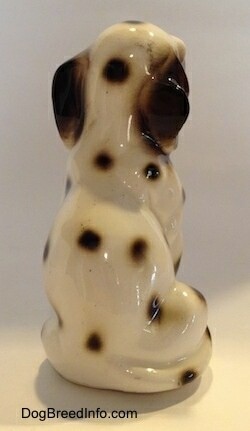 It is the same mold as “Muttsey Paw Up.” It is 1 inch tall from the ground to the top of the head, 1 1/4 inch long from the back of the leg to the front paw and 3/4 inches wide across the front from paw to paw. It was designed by artist Tom Masterson. The other three pups are item number 498. The pup that is not on the card is from the 1980s. 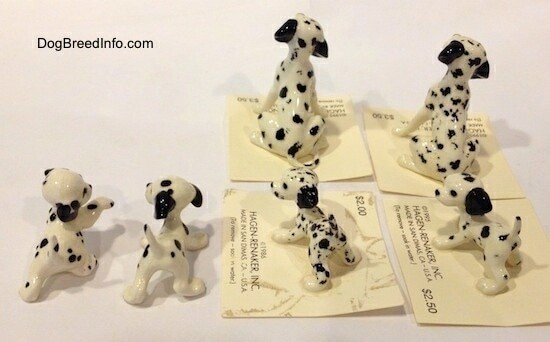 The pup with the cluster of smaller spots is on a card that is dated 1986 and the pup on the far right is on a card that is dated 1995. 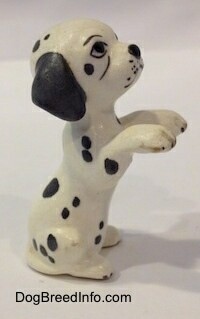 This figurine is 1 inch tall from the ground to the top of the head, 1 3/8 long from the end of the ear to the back of the leg and 3/4 inch wide across the back legs from paw to paw. 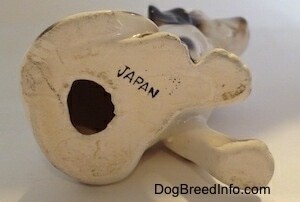 This mold was also used to make the hound puppies. It was designed by artist Helen Perrin Farnlund. 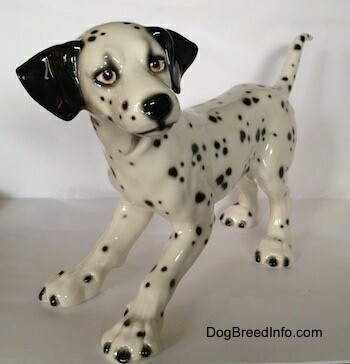 The two adults in the back are called “Dalmatian Mama.” They are item number 497. 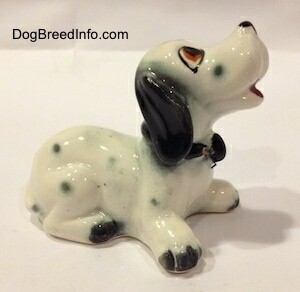 Both “Dalmatian Mamas” are on cards which are dated 1995. It measures 1 7/8 inch from the ground to the top of the head, 1 3/4 inch long from the front paw to the back of the tail and 1 1/4 inch wide across the back from hip to hip. 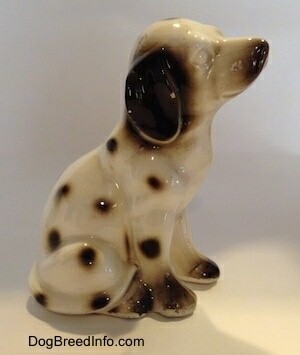 This same mold was also used to create the brown and white hound dog and the tricolor hound dog. It was designed by artist Helen Perrin Farnlund. 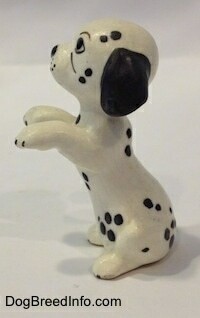 This is the Hagen-Renaker DW (Designers Workshop) Dalmatian pup “Sparky” in a begging pose. It was first issued in 1958 and retired in 1959. 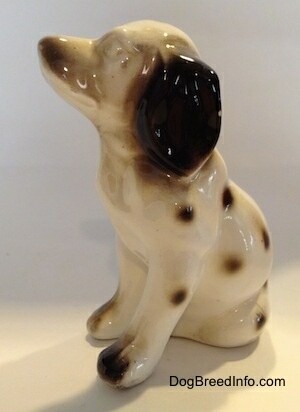 This is a vintage hand painted dog done in a matte finish with only two areas of gloss, the eyes and nose. It stands 2 1/4 inches tall, 1 1/2 inch wide from the base of the tail to the front of the paws and 3/4 inch wide from hip to hip. It is in great condition. It was made in the USA. 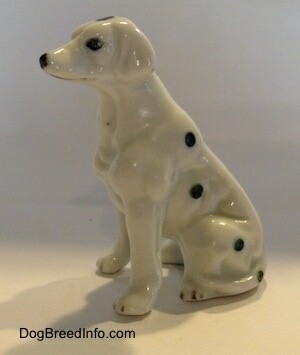 Shown is a vintage bone china Dalmatian dog in a sitting pose. 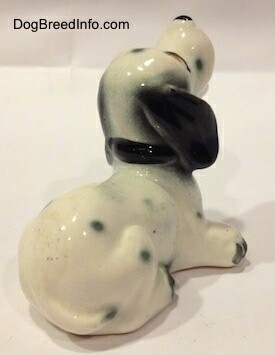 This is a white figurine with a black nose and green spots. Yes, green. Someone obviously grabbed the wrong color when hand painting this dog. 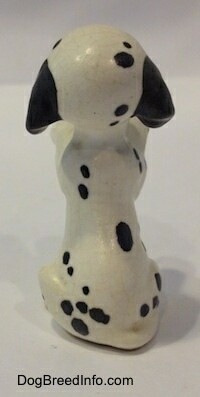 ;-) It stands 3 1/4 inch tall, about 2 1/2 inch long and 1 1/2 inch wide. It's in excellent condition with no chips, cracks, breaks or repairs. 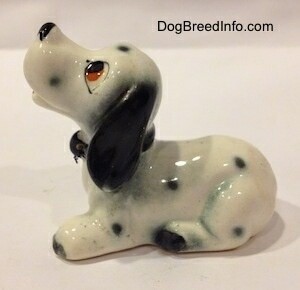 Vintage hand painted Dalmatian dog puppy. This figurine has the loop in the collar where a chain used to be. 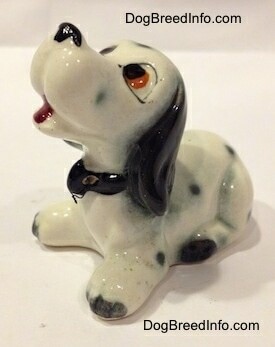 This was popular in the 1950s figurines. I am not sure how old this pup is. I bought it used at a flea market. The years I have owned it alone make it vintage. 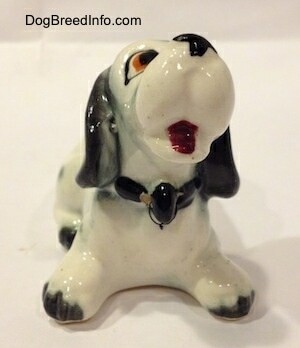 It is in a lying down pose with the mouth open as if it is barking at something. It is about 2 1/2 inches tall from the ground to the top of the nose, 3 inches long from the back tail area to the tip of the nose and 1 3/4 inches wide from front paw to front paw. 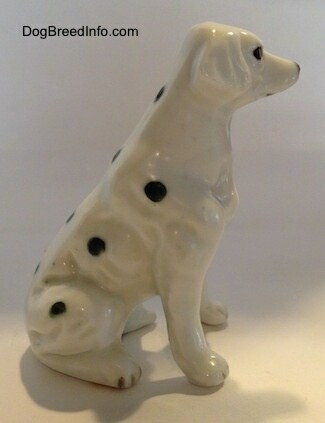 Ceramic vintage Dalmatian dog in a sitting pose—it has Japan stamped on the bottom. Seems someone forgot to paint his poor eyes. 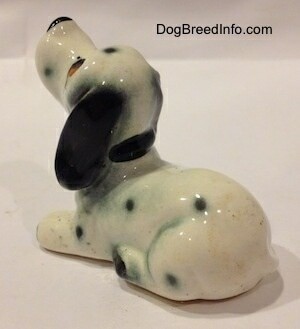 It is about 3 1/2 inches tall, 2 1/2 inches long and 2 inches wide.